It has been a VERY long time since I have posted anything. While taking a break from blogging, I made two simple granny square blankets, for my favorite niece and nephew. 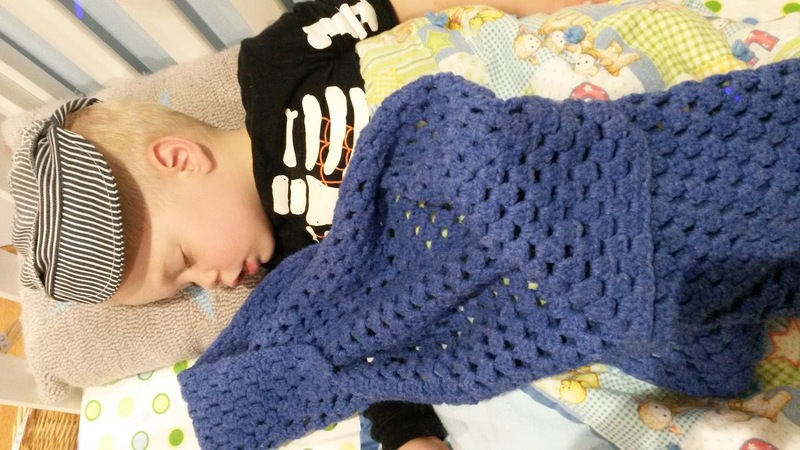 Kai's is a simple blue granny square with a triangle hood. I just kept making the square bigger until it was the size that I wanted. 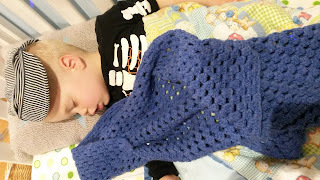 Annalise's blanket is also made with granny squares. I decided what I wanted it to look like on graph paper so that I would know how many granny squares to make. 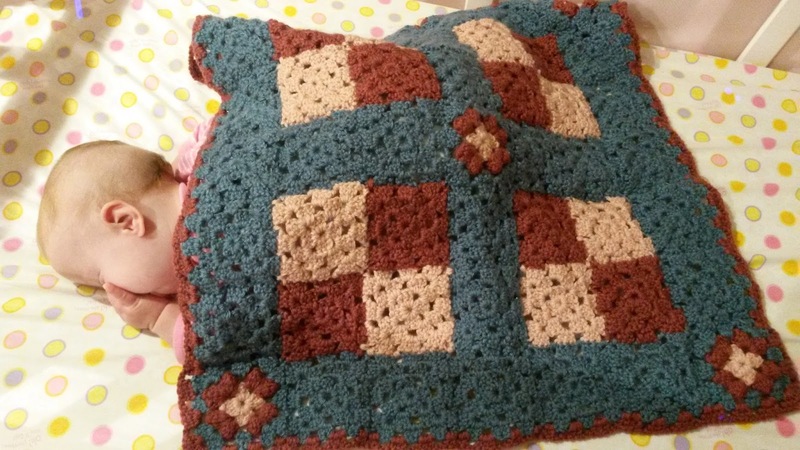 It looks fancier, but it is still just a regular granny square blanket. You can learn how to make your own granny squares from this tutorial (coming soon). This pattern was actually a happy accident. I originally wanted to make a drawstring mushroom pouch, but I wasn't exactly pleased with the way it was coming out. 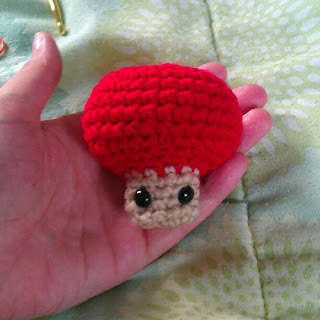 Rather than pulling out the stitches and starting over, I decided to continue with the project and make a mushroom amigurumi. As long as gauge is consistent, it is not important for this pattern. When you have completed the first few rounds of the head, add some stuffing. If it appears that the stitches are too large to hold the stuffing without it being visible, either increase the yarn tension or use a smaller hook. 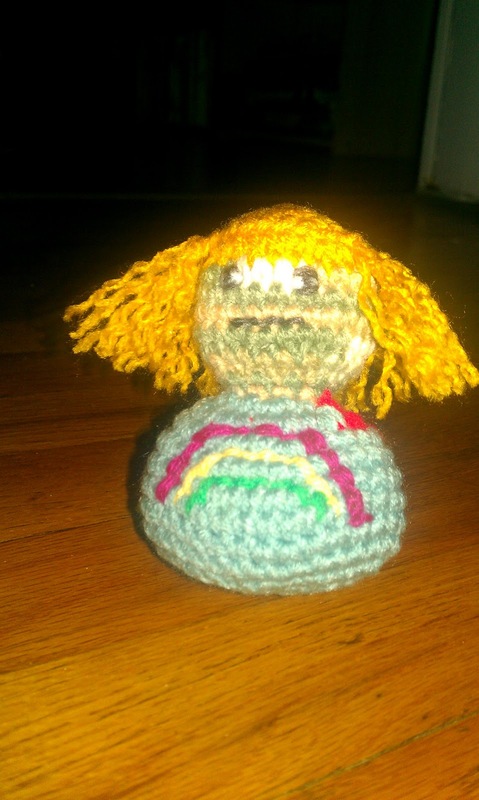 The amigurumi pictured is about 2.75 inches tall. 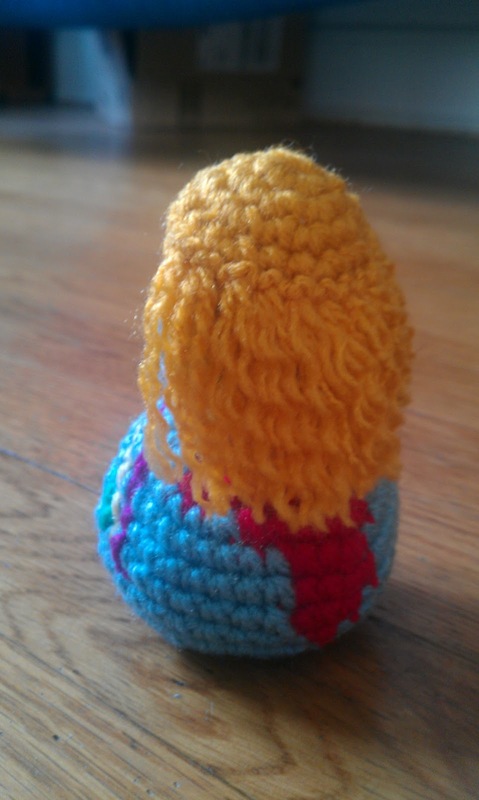 This pattern is done in the traditional amigurumi spiral. Rounds are continuous and are not joined. For this reason, it is important to use a stitch marker to keep track of the first stitch of each round. Rnd 1: 6 sc in the ring, pull tight to form the round. (6). Insert your safety eyes in between the the previous 2 rnds. Place them on the opposite side of the st marker with 1 to 2 sts in between each eye. Finish stuffing your amigurumi being mindful of the safety eyes. Fasten off leaving a long tail. Using your blunt yarn needle, stitch closed the last four stitches. Tie off and weave any lose yarn ends into the amigurumi. With C, make a magic circle, ch 1.
sl st in the next st and fasten off leaving about a 12 inch tail. Position your spots into your amigurumi and hold in place with pins. 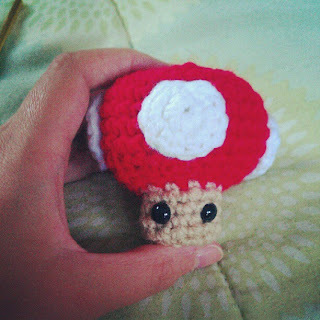 Using your yarn needle, sew the spots to the top of the mushroom. When you have finished, weave away any loose ends. Now you have the Super Mushroom from Mario! What will you make grow??? 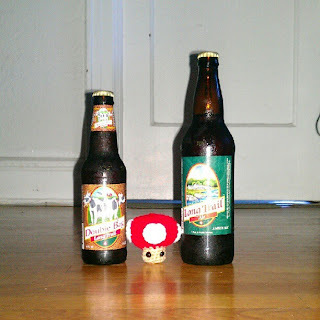 If you email me (nicr0ch3t@gmail.com) a picture of your Super Mushroom, I will feature it on this blog, as well as both the Nicrochet and Necrochet facebook pages. I would love any feedback about this pattern that you might offer. If you find any errors, please let me know and I will make corrections. Also, it is fine to use this pattern to make projects for both sale and personal use. Please do not sell this pattern as your own. If you would like to share this pattern with a friend, feel free to send them a link to this blog post. Here is a little video that I made of our Zip Lining Adventure! Since I learned to crochet from books and YouTube video's I have been wanting to begin making DIY crochet videos for a while. It's not instructional. It was just an experiment with the camera. The sound quality on my camera was a little off, so I added some music instead. Hopefully the next one will be much better! I love zombies! Zombie books, zombie movies, zombie shows, zombie crafts. 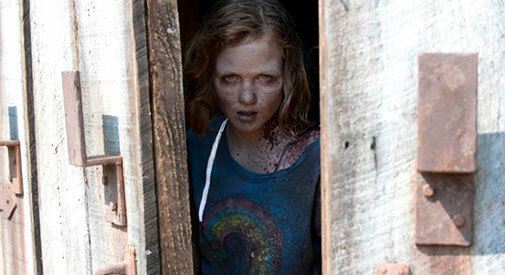 Having read most of the comic series The Walking Dead by Robert Kirkman, I am very pleased with the show on AMC. Many people dislike when a series deviates from the original plot lines, but I love it. The changes made allow me to continue to be interested and continue to be surprised. One of my favorite changes was adding the character Daryl Dixon. After season two's mid season finale (which inspired my zombie Sophia cat toy) I can not wait for the show to come back on February 12th! Here is a crochet pattern that should get you through the next week, until we see the return of season two of AMC's the Walking Dead. As long as gauge is consistent, it is not important for this pattern. When you have completed the first few rounds of the head, add some stuffing. If it appears that the stitches are too large to hold the stuffing without it being visible, either increase the yarn tension or use a smaller hook. The amigurumi pictured is about 12 inches. With A, make a magic, and ch 1. Join the last st of Rnd 34 to the next st with a sl st and fasten off. Weave away the tail. Stuff the torso. Join the last st of Rnd 23 to the next st with a sl st and fasten off. Leave a 12 inch tail to attach the arms later. Stuff the arms. With B, make a magic circle, ch 1. Change to C when there are two loops left on the hook for the last st of Rnd 12. First leg only: Join with a sl st to the next st. Fasten off leaving a 12 inch tail. Second Leg only: Place a st marker in the last st without joining or fastening off. Joining the legs: Face the legs so that they are next to each other with the tail of the first leg in the middle of the legs. Thread the long tail through your yarn needle. Use a whip stitch to join two sts from each leg. Tie a knot, and weave away the tail. There should be 14 st left on each leg, 28 in all. Join with a sl st to the next st. Fasten off leaving a 24 inch tail. Attach the top/bottom: Stuff bottom half of amigurumi. Look inside the torso and find Rnd 31, where you had crocheted in the FL only. Using your yarn needle attach the top of the pants to the BLs of the sts from RND 31 with a whip st. Go around twice to make sure your amigurumi is firmly attached. Attach the arms: Pin the arms where you would like them. Using the tail you left at the end of the arms, neatly sew the arms to the body. Make sure that the thumbs (bo) are facing up. Hair: Eyelash yarn, can sometimes be difficult to work with. Because of this, it is often better to crochet with less tension on the yarn. Remember that when using eyelash yarn, the wrong side/inside of your work is often more fuzzy than the right side/outside of your work. You have two options, you can either crochet as you normally would and then flip it inside out, or you can crochet along the inside rim of the hair wig. Fasten off and leave a long tail. Position the hair on Daryl’s head. If necessary, pin it in place. Using a blunt needle and the tail, go around and fasten the hear to the head using a whip stitch. Hide the rest of the tail inside your amigurumi. Face: Using your embroider floss, crochet Daryl’s face onto the amigurumi. Be careful that you are not pulling stuffing forward as you embroider your face. You can copy the face as you see it in the picture, or create your own. If you are not familiar with making a face, practice on some felt before hand or use a different type of face. Some people use beads or safety eyes. Others cut out little pieces of felt in the shapes of different facial features. You can also make eyes with polymer clay. The possibilities are endless, so don’t be afraid to be creative. Squirrels: The squirrels are made with brown polymer clay. Make sure that you put a hole in the head of the squirrel like a bead before you bake the clay so that you put string through it afterword. Follow the directions for your polymer clay when baking the squirrels. After you string the squirrels, just put them over Daryl’s shoulders. Crossbow: Make your crossbow using the polymer clay. Follow the polymer clay directions for baking your clay. In order to attach the cross bow, put the arms in the desired position. Using color A, add a few sts to hold the arms together. 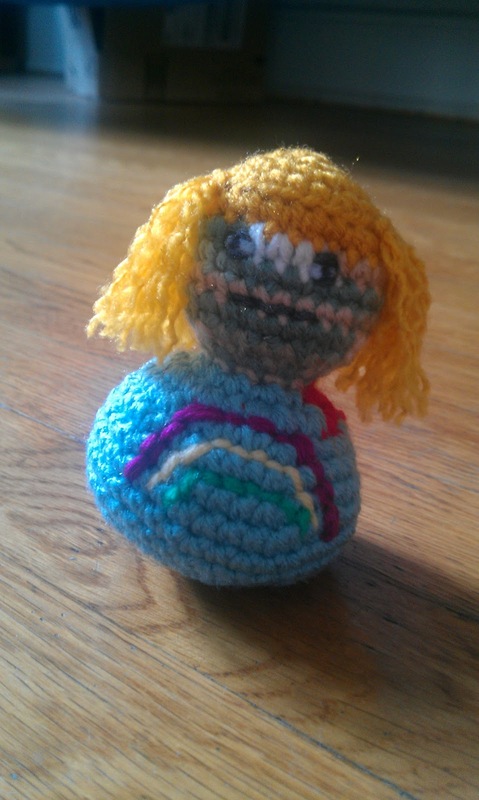 In the amigurumi above, the right hand is stitched to the left wrist. Now all you need to do it glue the cross bow into place. After adding the glue, put a large binder clip to hold it in place until the glue is dry. Voila! Now you have Daryl Dixon from AMC’s the Walking Dead! 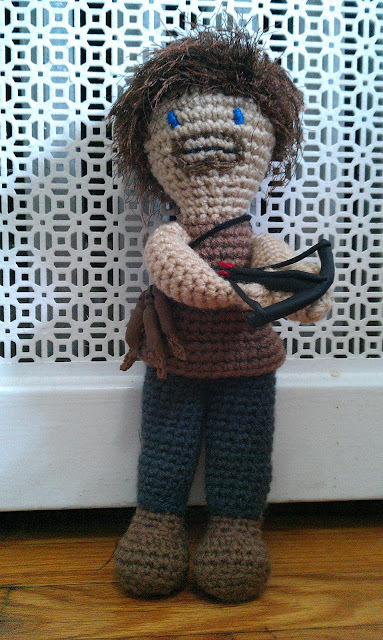 If you email me (nicr0ch3t@gmail.com) a picture of your Daryl Dixon, I will feature it on this blog, as well as both the Nicrochet and Necrochet facebook pages. I am very excited to announce that I have officially opened an Etsy Shop! Right now I only have one item listed, but it is still very exciting. Since I am in a full time MS OT program, I haven't had a lot of time to crochet (or update here), but with winter break coming up I plan to remedy that shortly. Those who know me are used to the fact that when I get into something, I become completely absorbed. My current obsession is the book series A Song of Ice and Fire by George R. R. Martin. In this series, Martin yarns a tale about those who would sit upon the iron throne of Westeros; a large kingdom reminiscent of Medieval Eurasia. Though the books are technically in the fantasy genre, the stories are not about magic. They are more about the character's struggles and the politics of love, war and power. There are mythical creatures in these books, but they are not the center of the story. They are there to add to something that is already intriguing and enthralling on its own. Those who have not read the books may already be familiar with some of the characters. The HBO series Game of Thrones is based on the series and the first season is the first book, also entitled Game of Thrones. As Martin is one of the co-executive producers, the series holds true to the stories. The actors in this series are fantastic, and the cinematography is phenomenal. As they have in the past with shows like Deadwood, HBO is able to deliver a show that is both fantastical an grounded by realism. Each character is fully developed with both endearments and flaws. After watching the series and reading the books, there are a few characters who really stand out for me. One of them is Daenerys Targaryen. Daenerys is the exiled princess of Westeros. After being smuggled out of Westeros with her brother Viserys during the uprising that left her an orphan, she has been living in the Free Cities beyond the narrow sea. Daenerys is a character who we see grow from a shy and scared child at the beginning of the first book to a powerful queen who is determined to take back what she sees as rightfully her's. 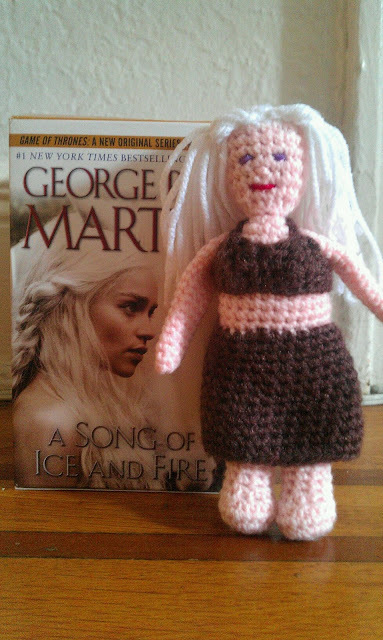 Here is my amigurumi of Daenerys Targaryen. I don't have a pattern for this one yet, because I made it up as I went along. I didn't notice any patterns on Ravelry either, but I'm sure there will be as more people discover the show and the books.